San Diego, Calif. (May 18, 2013) – SPEED Energy Stadium SUPER Trucks made a return trip to Qualcomm Stadium in San Diego, Calif., for the second and final time in 2013. Five distinct racing divisions took to the track to test their driving skills on the uniquely prepared dirt and asphalt course. Robby Gordon, Larry Swim, Apdaly Lopez, Derek Costella and Shelby Anderson were able to record wins in Round No. 5 of SST competition. Robby Gordon, of Orange, Calif., driving the #7 SPEED Energy / MAPEI / Toyo Tires truck held off the hard charging Sheldon Creed of Alpine, Calif. to claim his second SPEED Energy Stadium SUPER Trucks victory of the season. The 20-Lap SPEED Energy Stadium SUPER Trucks final began from a staggered start, and saw first place starter Arie Luyendyk Jr. from Scottsdale, Ariz., quickly jump out to the early lead navigating his way through the first set of turns. Iron River, Mich., driver Nick Baumgartner would waste no time working his way past the No. 25 to lead Lap-1. Using the clear track to his advantage Gordon would take the cross-over option on Lap-2 to race his way to the front of the field from the fifth starting position. Scottsdale, Ariz., native P.J. Jones driving the No. 98 American Racing Wheels truck found trouble on Lap-5 flipping over. On the restart second running Baumgartner would high center his truck on one of the jumps and become stuck losing multiple positions. Outside front row starter Sheldon Creed would work his way back into the mix, battling Gordon for the lead on Lap-11. The 15-year old young gun would take the lead away from the off-road veteran for a half lap before Gordon would battle back to a slight advantage with Creed glued to the rear bumper. Lap-14 saw Baumgartner would lose the handle on the No. 12 making contact with the outside k-rail with the truck coming to a rest on top. Creed would work to the inside of Gordon once again on Lap-18, as the two would race side by side for much of the lap before the No. 7 would power back ahead. Creed would make one more run at Gordon on the final lap, but could not find the opening to get past. Gordon would race the No. 7 SPEED Energy / MAPEI / Toyo Tires truck to a Round No.5 victory ahead of Creed and third place finisher MacCachren. Apdaly Lopez took the lead on Lap-3 en route to taking his second straight SST win in the 12-lap SUPER Buggy final. Rob Archibald and Michael Ward started the 12-lap SUPER Buggy final, which saw Archibald jump out to the early lead before stopping shortly after for a broken right front suspension. Michael Ward would find trouble on Lap-2 turning over his No. 317 SUPER Buggy bringing out the red flag. On the restart Lopez would waste no more time getting to the front of the field driving past leader Eddie Tafoya. The No. 84 of Jerry Welchel was next to challenge Tafoya for the second position, battling back and forth until Welchel eventually took the lead on Lap-6. Trouble would find Welchel two laps later as the No. 84 became stuck in the sand losing multiple positions and fading back into the running order. Lopez would not look back driving away to capture the win over Eddie Tafoya and third place finisher Michael Ward. Other winners included Larry Swim’s SPEED Energy BIGFOOT defeated Darren Minges driving Bounty Hunter in a classic Monster Truck duel; Shelby Anderson, bested 13 competitors in the SUPER Trophy Kart division to become the first female winner in series history. Derek Costella ran away with the victory in the SUPERMoto Final to mark his name in the record books as the division’s first winner in series history. The Inaugural season of SPEED Energy Stadium SUPER Trucks continues Saturday night, June 8 , in St. Louis, Mo. at the Edward Jones Dome with a full slate of Stadium SUPER Trucks, Monster Trucks, SUPER Buggy, SUPERMoto and SUPER Trophy Kart racing on a specially designed course. Tickets to SPEED Energy Stadium SUPER Trucks at Edward Jones Dome start at just $20 for adults with kid’s 12 & under are $10 off with a purchased adult ticket at the stadium box office or through Ticketmaster at ticketmaster.com or 800-745-3000. 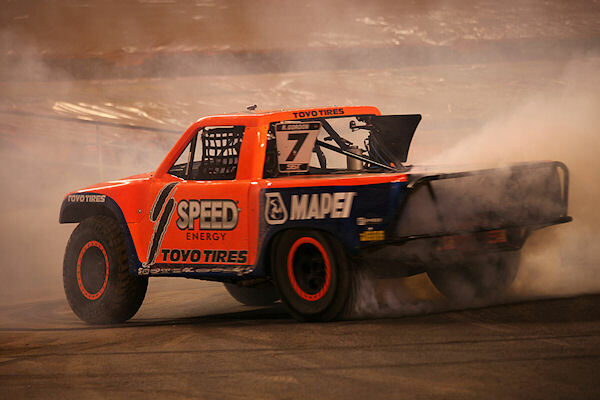 All 11 SPEED Energy Stadium SUPER Truck events in 2013 will be televised on weekends and featured on NBC Sports: seven on NBC and five to be televised on the NBC Sports Network. Round No. 5 from Qualcomm Stadium in San Diego, Calif., will be shown on Sunday, May 25 at 12:30 P.M. ET. on NBC Sports Network. Please check your local listings for channel. Stadium SUPER Trucks Final (20 Laps): 1. Robby Gordon; 2. Sheldon Creed; 3. Rob MacCachren; 4. Arie Luyendyk Jr.; 5. Ricky Johnson; 6. Jerett Brooks; 7. Greg Adler; 8. P.J. Jones; 9. Justin Lofton; 10. Lalo Laguna; 11. Nick Baumgartner; 12. Jesse Johnson; 13. Mike Jenkins. Monster Truck Final (2 Laps): 1. Larry Swim; 2. Darren Minges. SUPER Moto Final (15 Laps): 1. Derek Costella; 2. Dustin Hoffman; 3. Danny Casey; 4. Brandon Ward; 5. Tim Valasquez; 6. Ron Reed; 7. Jeremy Toye; 8. Steve Marty; 9. Lance Garza; 10. Steve Drew. SUPER Buggy Final (10 Laps): 1. Apdaly Lopez; 2. Eddie Tafoya; 3. Michael Ward; 4. Eric Jacobus; 5. Jerry Welchel; 6. Rob Archibald. SUPER Trophy Kart Final (12 Laps): 1. Shelby Anderson; 2. Gavin Harlien; 3. Darren Hardesty Jr.; 4. Broc Dickerson; 5. Eliott Watson; 6. Christopher Polvoorde; 7. Trevor Briska; 8. Brock Heger; 9. Myles Cheek; 10. Cole Marner. Stadium SUPER Trucks LCQ (6 Laps): 1. Ricky Johnson; 2. Justin Lofton; 3. Greg Adler; 4. Lalo Laguna; 5. Mike Jenkins; 6. Jesse Johnson; 7. P.J. Jones. Stadium SUPER Trucks Heat 1 (10 Laps): 1. Robby Gordon; 2. Nick Baumgartner; 3. Arie Luyendyk Jr.; 4. Justin Lofton; 5. Ricky Johnson; 6. Lalo Laguna; 7. Jesse Johnson. Stadium SUPER Trucks Heat 2 (10 Laps): 1. Rob MacCachren; 2. Sheldon Creed; 3. Jarrett Brooks; 4. Greg Adler; 5. Mike Jenkins; 6. P.J. Jones.